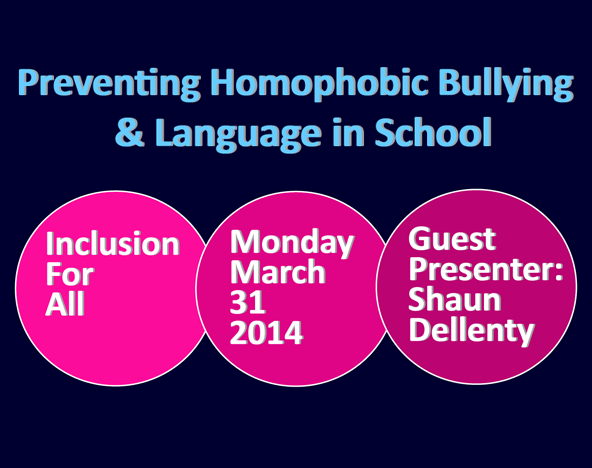 Award winning conference, Inclusion for All – Preventing Homophobic Bullying & Language in Schools, will be held for the first time in the North West at Weatherhead High School, on Monday 31st March 2014. This one day event, in collaboration with Weatherhead High School, will be hosted by Shaun Dellenty, a leading educational professional on issues surrounding homophobic bullying. Shaun, a Deputy Headteacher of Alfred Salter Primary School in London, is an inspiring and motivational speaker who has presented at anti-bullying, Stonewall & NCTL events. Shaun has supported the NCTL, Department for Education and Stonewall in developing strategies for tackling homophobia in schools. In 2012, Shaun was nominated for a ‘European Diversity Champion Award’ and has been voted one of the ‘101 most influential LGBT role models’ in the Independent on Sunday Pink List 2012 and 2013. The session will begin with a talk from an Ofsted-seconded Headteacher to give the day an inspection viewpoint around the section 5 additional guidance ‘Exploring the school’s actions to prevent & tackle homophobic & transphobic bullying’, followed by Shaun’s training on how to combat and support your staff to become more confident with such issues. This event is aimed at Governors, Senior Leaders or other staff with a lead role in anti-bullying / equality issues within schools.